Lot:9444 Fr. 2404. 1928 $50 Gold Certificate. PMG Choice Uncirculated 63 EPQ. Fr. 2404. 1928 $50 Gold Certificate. 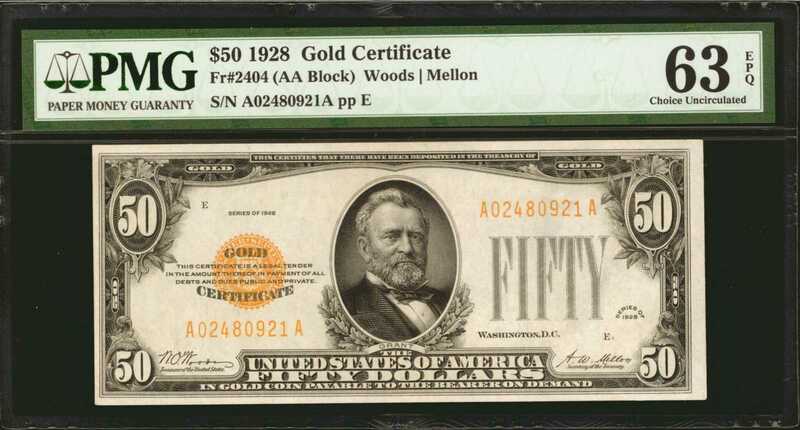 PMG Choice Uncirculated 63 EPQ.Locating any example of this higher denomination $50 Gold Certificate design in Choice Uncirculated grades is highly difficult. Even more so when combined with the "EPQ," designation seen here. The term "pack fresh," comes to mind when describing this note as the inks are bold, the embossing nice and the appeal of a near Gem is had. The price for this note jumps drastically once the Gem grade is achieved, making these Choice Uncirculated piece very attractive to collectors.